Decisional Regeneration has permeated much of the Christian Church in a deceptive way. Like Baptismal Regeneration, it sees the new birth as the result of a mechanical process that man performs, ignoring the sovereign work of God in giving men new hearts. 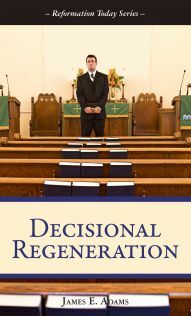 The practice of Decisional Regeneration in the Church must be exposed—in order to save men from the damning delusion that because they have "decided" or "signed a card," they are going to heaven and are no longer under the wrath of God. The purpose of this booklet is not to question the sincerity of some Christians or to malign them, but to unite Christians in biblical truth. The gospel alone is the power of God unto salvation and the true basis of Christian unity. Since 1980, Dr. James E. Adams has been pastoring the congregation at Cornerstone Church in Mesa, AZ, having served several years previously as a missionary in Colombia. He and his wife Nancy have three children and two grandchildren. He remains actively involved in missions and literature work in Colombia, Mexico, Nicaragua, Cuba, Argentina and other Latin American countries. His book Liberacion El Evangelio de Dios is an exposition of the gospel set in the Latin American culture. He is also the author of War-Psalms of the Prince of Peace. Jim is a native of Arizona with theological degrees from The Theological Seminary of the Reformed Episcopal Church and Westminster Seminary in California. 6. What Must We Do?